The progression of Porsche's three-pronged electrification strategy continues with the plug-in Cayenne E-Hybrid. The latest Cayenne is Porsche's third new hybrid system, following on the system used in the Panamera and 918 Spyder. In addition to the new hybrid system, the latest Cayenne E-Hybrid offers several firsts for the Cayenne range. 22" wheels, massaging seats, heads up display and a heated windshield are offered for the first time in Cayenne. Aesthetic changes are subtle, and include Acid Green brake calipers and matching outlines around the badging. The most important changes, however, are under the skin. The hybrid system's electrical component is centered around a 14.1 kWh battery pack housed under the rear cargo floor. This battery pack stores enough power to run the Cayenne solely on electricity for up to 44 kilometers, and a maximum speed of 83 miles per hour. This pack is roughly 30% larger than the preceding Cayenne Hybrid, and consists of 8 modules with 13 prismatic lithium ion cells each. With a 230-volt, 32 amp connection it is possible to recharge a fully-depleted battery in 2.3 hours using an optional 7.2kW onboard charger. With the standard 3.6kW charger and a 230-volt, 10 amp connection the battery can be recharged in 7.8 hours. The battery pack drives an electric motor that creates 134 horsepower and 295 lb-ft of torque. The electric motor operates in conjunction with the familiar 3.0L single-turbo V6 with 335 horsepower and 332 lb-ft of torque. Thanks to a combined system power of 455 horsepower and 516 lb-ft of torque. This system can propel the Cayenne to 60 MPH in 4.7 seconds and through the quarter mile in 13.3 seconds, improvements of 0.7 and 0.9 seconds over the preceding model. The electric motor is positioned between the 3.0L V6 and the 8-Speed Tiptronic S transmission. The motor and transmission are connected by an electromechanically-actuated separating clutch. The 8-speed transmission is optimized for smoother, faster shifts than earlier transmissions. The top track speed of 157 MPH is reached in sixth gear, and 7th and 8th gears are optimized for fuel efficiency. Porsche Traction Management (PTM) and Porsche Active Suspension Management (PASM) are included as standard. The Cayenne's active hang-on all-wheel drive system is governed by an electronically regulated, map-controlled multiplate clutch. In conjunction with the Cayenne's broad torque range, the system offers superior driving dynamics and off-road capabilities. In lieu of PASM customers can also select the same three-chamber air suspension offered in other Cayennes. E-Power - This full-electric mode will allow the Cayenne to travel up to 44 kilometers on electricity alone before engaging the gasoline engine. Hybrid Auto - This conventional hybrid mode allows the vehicle to distribute power from the gasoline engine and electric motor for maximum efficiency. E-Hold - This mode retains the present level of charge, allowing the driver to select a full-electric mode for driving in an environmental zone at their destination. E-Charge - In this mode the gasoline engine generates more power than is required for normal driving. Excess power is channeled into the battery pack to be stored for later use. 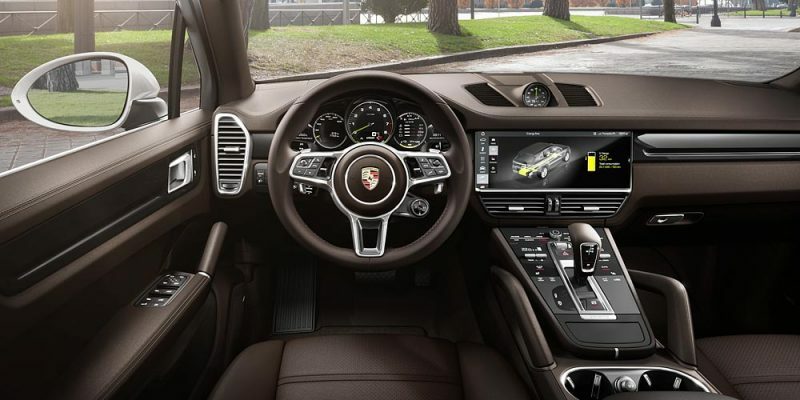 The hybrid system's charging process can be controlled using PCM or remotely with the Porsche Connect app. With an enabled smartphone, owners can access climate control systems and monitor charging. These features are available as standard on the E-Hybrid. Other features include a new full-color heads-up display, off road data monitoring, and track data logging. Porsche InnoDrive will be available for the first time in the Cayenne E-Hybrid. This system is an evolution of adaptive cruise control, and combines traffic sensing systems with onboard map data. The vehicle can monitor traffic and terrain 1.8 miles ahead, and can make coasting and gearing decisions for optimal efficiency. The Cayenne E-Hybrid is available with 22" wheels, a first for any Porsche model. Exterior trim includes Acid Green painted brake calipers, and matching trim on exterior badging. The Acid Green theme continues inside, with green needles on the analog gauges, and green accents on the dash displays. The new Cayenne E-Hybrid is expected at U.S. dealers in early 2019. The base MSRP is $79,900, excluding options and the $1,050 delivery, processing and handling fee. In Canada pricing starts at $91,700.